Born Adventurer tells the story of Frank Bickerton (1889-1954), the British engineer on Sir Douglas Mawson's Australasian Antarctic Expedition of 1911-14. The expedition gave birth to what Sir Ranulph Fiennes has called 'one of the greatest accounts of polar survival in history' and surveyed for the first time the 2,000-mile stretch of coast around Cape Denison, which later became Adelie Land. The AAE was however only one episode in a rich and colourful career. Bickerton accompanied the ill-fated Aeneas Mackintosh on a treasure hunt to R.L. Stevenson's Treasure Island, was involved with the early stages of Sir Ernest Shackleton's ill-fated Imperial Trans-Antarctic Expedition, and tested 'wingless aeroplanes' in Norway. 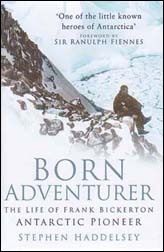 Born Adventurer follows him through his many experiences, from his flying career in the First World War to his time in California, mixing with the aristocracy of the Hollywood and sporting worlds and from his safaris in Africa to his distinguished career as an editor and screenplay writer at Shepperton Studios. Stephen Haddesley draws on unique access to family papers and Bickerton's journals and letters to give us a rich and full account of the story of this incredible adventurer and colourful man.